Siemens is opening a new Locomotive Service facility in New Castle, Delaware that will operate as the company’s digital service, supply chain, and technical field training hub in the region. The 44,000 square-foot New Castle facility will combine Siemens’ global digital analytics know-how with its extensive industry knowledge to move rail further into the digital age. Using the latest in digital and predictive technology, the New Castle team will train service technicians and remotely maintain Siemens locomotives for customers across the U.S. including Amtrak, the Maryland Transit Administration, the Southeastern Pennsylvania Transportation Authority, Brightline, and the Illinois Department of Transportation, among others. Members of Siemens’ Digital Rail Services team located in New Castle will remotely collect and analyse over 800 data points from each locomotive daily. The data includes information on equipment health, operational metrics and environmental data made available by automatic, continuous streaming from the locomotive. The data, pulled in real-time, can help diagnose fleet issues and develop predictive maintenance capabilities so issues can be identified issues before they become a problem. The Siemens team is already putting its data capabilities to use by working with Amtrak to monitor and analyse data from 70 Siemens-built ACS-64 locomotives running along the Northeast Corridor. On-board information is sent automatically to Siemens “Smart Cockpit” software that helps analyse and flag any items that require closer attention, like if a locomotive is exceeding certain temperature levels. The Siemens team reviews flagged items and recommends actions that are relayed directly to the local technical advisors and Amtrak maintenance experts at the depots along the corridor. Data already collected has led to Siemens and Amtrak to design and implement software updates that improved the ACS-64’s performance, helping Amtrak achieve about 33 percent fewer delays in 2016 compared to 2015. The team will also use virtual reality technology for maintenance training on different locomotive equipment running worldwide. Using virtual reality goggles and handheld controls, the service technician can virtually stand inside a locomotive and use the handheld controls to work on switches, components and panels. This training will prepare them both mentally and physically for work on actual locomotives at customer locations across the U.S. In addition to remote data services, the new facility will include a supply chain distribution centre to quickly deliver locomotive parts for locomotive customers. The hub will rely on Siemens robust supply chain from partners across the U.S and will rely on 16 full-time positions based at the New Castle hub to work with the company’s nearly 70 existing service employees at customer sites. The New Castle facility builds on Siemens efforts to digitalise the rail industry including the recent announcement of the company’s Digital Rail Services portfolio and hub in Atlanta, GA. 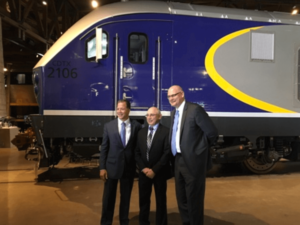 The facility will also expand on existing service work with customers across the region including a 15-year technical support and spare parts supply agreement with Amtrak and the 70 Siemens-built ACS-64 electric locomotives operating along the Northeast Corridor, and Brightline where Siemens was chosen not only as the trainset manufacturer but as the sole service provider for the new Florida rail system. Original article © Siemens USA. FOR ALL THE LATEST INFORMATION, NEWS, IMAGES, VIDEOS AND ARTICLES ON ALL ASPECTS OF TRAIN OVERHAUL / MAINTENANCE, PLEASE CLICK HERE.